Happy French Friday! We are going to do some catching up today. I mentioned last week that I had a couple of French Fridays with Dorie recipes to catch you up on. Plus I also have this week’s recipe to tell you about. I had hoped to get to the catch-up recipes earlier in the week, but that obviously didn’t happen… Let’s get to it! The title of this recipes says it all. It is a basic recipe for French lentils (lentilles du Puy) that can be used as a side dish or the base for a salad. I served mine as a side dish with grilled chicken stuffed with sage and mozzarella. I topped them with Honey-Roasted Cherry Tomatoes from the book River Cottage Veg. The combination of all these flavors was excellent! I enjoyed this dinner very much. While I liked the lentils, my husband merely tolerated them, so I will likely not make this recipe again, unless I find the perfect dish that needs lentils on the side. Next up is a recipe the group made a few weeks ago called Chanterelles with Napa and Nuts. 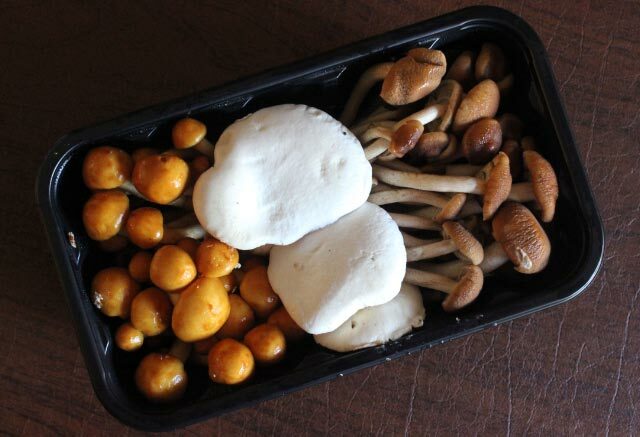 I wasn’t able to find chanterelle mushrooms (though the guy in the produce department said they had them just the week before), so I used a gourmet mushroom mix instead. 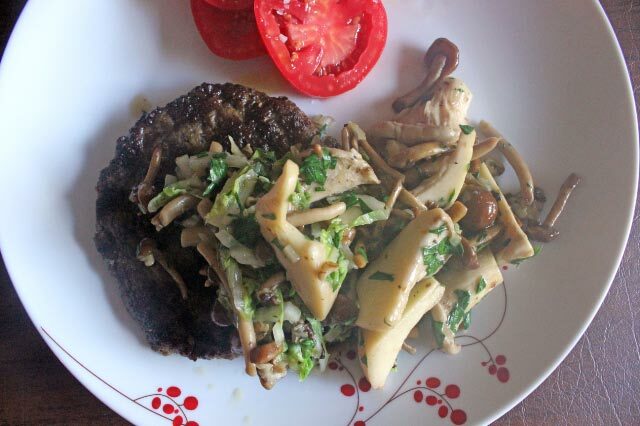 This dish was a quick saute of mushrooms and Napa cabbage, garnished with parsley and chopped nuts. It would be excellent as a side dish to all sorts of meats, especially grilled steak. My husband was out of town the week I made this dish, so I served mine with a simple hamburger patty cooked on the stove. I really, really loved the mushrooms! The title of this recipe didn’t appeal to me, but you must look past that and make this if you like mushrooms. A winner! I finally got a few zucchini blossoms from my garden!!! I harvested 3 of them and made myself these blossoms for lunch one day. I tend to shy away from deep-frying things. It seems hard, and wasteful, and stressful. It really isn’t hard. The hardest part (for me) seems to be getting the oil to just the right temperature. 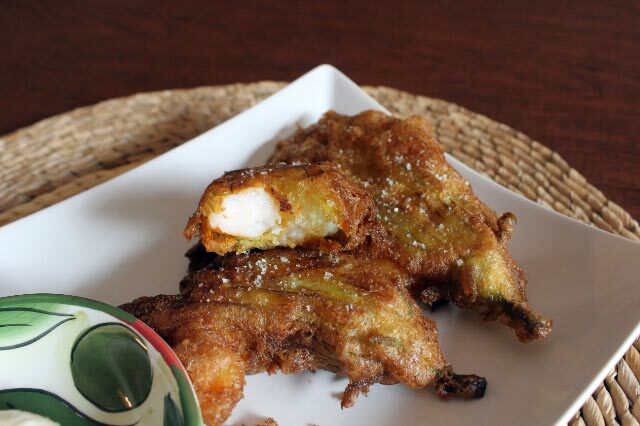 In this recipe, we simply stuffed the zucchini blossoms with large shrimp, dipped them in a tempura batter, and deep-fried them until done. I wish the recipe had specified what temperature the oil should be, because I think I had it too hot. My blossoms cooked faster than the recipe suggested they should. These were fun to make! I have never cooked with zucchini blossoms before, but I should since I have them in my garden. And the deep-frying would be easier with practice. Maybe next year I will try the goat cheese-tapenade variation! Whew, I’m caught up (on the writing, at least)! If you are interested in trying any of these recipes, be sure to check out Dorie Greenspan’s book, Around My French Table. On a related note, I finally pre-ordered Dorie’s new book, Baking Chez Moi: Recipes from My Paris Home to Your Home Anywhere. Now I will be ready to go when the group starts the new book! Are you looking for a delicious, satisfying, and healthy meal? Look no further than “Roasted Salmon and Lentils”! 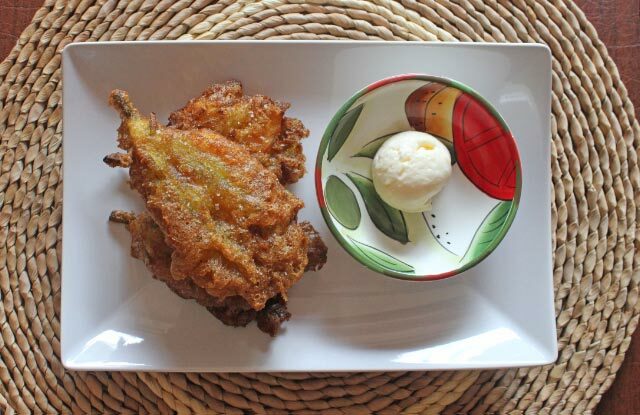 It’s this week’s French Fridays with Dorie recipe. 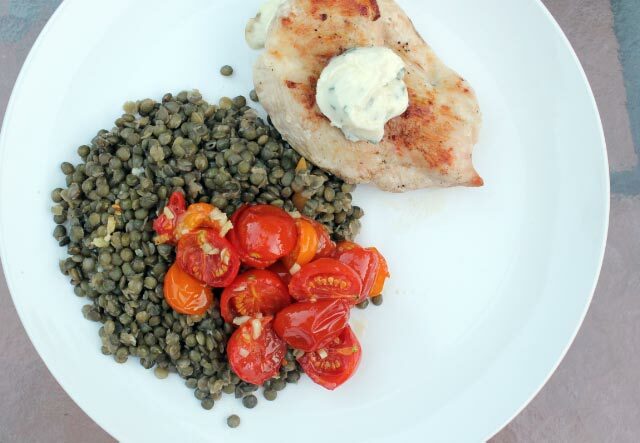 This recipe is a lesson in cooking lentils du Puy, or French green lentils. They are simmered to perfection with onion, a clove, carrot, celery, bay leaf, and chicken broth. A few of the lentils are removed and pureed, then the veggies are chopped and mixed back in. The result is very flavorful! The salmon is simply roasted in the oven with a bit of olive oil, salt and pepper. I loved this meal, and so did my daughter. She has always liked salmon, but she really liked the lentils too. She even had seconds! My husband liked the salmon and “tolerated” the lentils. You can find the recipe for “Roasted Salmon and Lentils” in Dorie Greenspan’s book Around My French Table. If you don’t have this wonderful book you really should get it!